No. 24 Florida Gators basketball (18-5, 8-2 SEC) won its fourth straight game in dominant fashion with a 88-66 rout of the No. 8 Kentucky Wildcats (18-5, 8-2 SEC) on Saturday night at the Stephen C. O’Connell Center in Gainesville, Florida. 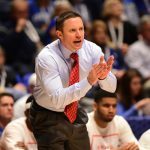 The 22-point margin was the largest ever by Florida over Kentucky, the the victory was a signature win for head coach Mike White. It was over when … After a 7-0 Kentucky run cut Florida’s large halftime lead down to just four points, the Gators outscored the Wildcats 24-14 to retake a double-digit advantage. But it was a 13-0 run midway through the second half that truly pushed UF in front as it gave the Gators a game-high 23 point lead and made it clear they would be coming out on top in the O’Dome. First half focus: It was a poor-shooting 20 minutes for both teams, but the Gators definitely got the better of the Wildcats in the opening period. Florida outrebounded Kentucky 34-13 (13-2 offensive) in the first half and had a drastic advantage on second-chance points (12-2) on the way to an eight-point halftime lead. A late 9-2 run with three straight triples pushed UF ahead by 13 points, but UK was able to cut into the lead and go into the locker rooms down by single digits. Florida would have been ahead by even more had it not struggled to move the ball offensively and coughed up the rock 12 times to just five for the visitors. Exceptional effort: Leave it to senior point guard Kasey Hill to have the game of his career in a massive moment. Hill scored a career-high 21 points on 8-of-16 shooting, dropped six dimes, grabbed five rebounds and only turned the ball over three times. Hill has been more efficient and had stronger efforts as a ball-handler, but his performance came in a key game at an important spot in the season for Florida. Significant stats: Florida outrebounded Kentucky 54-29 and had doubled up the margin on the boards at one point late in the second half. The Gators also scored 17 second-chance points (five for the Wildcats) and 18 points on the fastbreak (eight) on the evening, proving they were able to play up to the visitors’ high-tempo pace. Perhaps most importantly, UF cut down on its turnovers in the second half, only coughing up the ball five times after giving it away on 12 occasions in the first half. What it means: The Gators snapped a 12-game losing streak to teams ranked in the top eight of the AP Top 25. White earned a signature victory and ended a 1-11 skid against top 25 teams since arriving in Gainesville. UF snapped a five-game losing streak to UK, earning its first win against the hated rivals since March 16, 2014, and improved to 6-2 on ESPN College GameDay, including 6-1 against Saturday night’s visitors. Perhaps most importantly, Florida gained the knowledge that it is talented and well-coached enough to beat one of the more talented teams in college basketball this season after being humbled against similar opponents earlier this campaign. Up next: Florida’s two-game homestand comes to an abrupt halt as it plays three of its next four on the road. 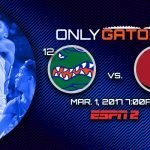 The first trip is to Georgia on Tuesday at 7 p.m. in a game that will air live nationally on ESPN2. First game at the new arena tonight. Wow. Highly recommend getting to a game this year. The team’s not too shabby either. How can there be no comments yet?? That was an incredible game to watch and thoroughly enjoyable. I believe Mike White is a great coach, and the way the team played defense was exceptional. I think the future is bright for the program. Outstanding effort and outstanding win!